How people respond to this journey then impacts on how they go on to live fibromyalgia. Here are some practical examples of how to learn to accept the new “me”. The process of learning to accept takes time. Everybody is different and some adjust more easily than others, but most participants explain going through phases of grief and anger, negotiation and reconciliation. Not all phases are equally long or equally pronounced. Also, the process is not linear. Emotions quell up unexpectedly and randomly. And having gone through a stage of anger doesn’t mean that all anger is over. For most participants the first important step was to accept the process for what it is – grieving for the lost me and adjusting to the new me. Some participants found that they needed to do things in order to learn to accept their life with fibromyalgia. Writing diaries or being creative through arts, crafts, gardening or poetry are particularly common strategies. The concept of an identity box was also helpful. 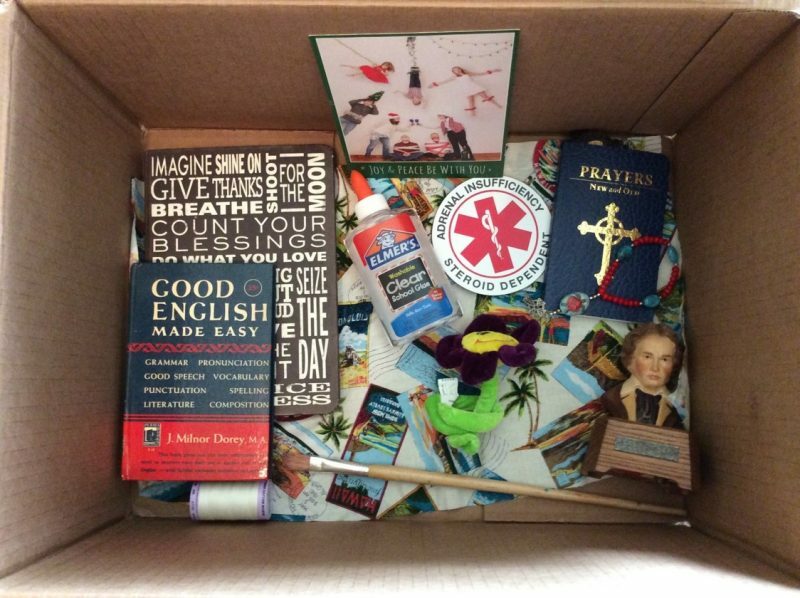 The photo with this post is an example for such a box, this is Linda’s. By focussing on who they are, research participants felt they became more aware that they are not their illness and that they have a lot to offer. Some participants found it difficult to accept that changes are necessary. But once they had learnt to accept that, they realised that they started to accept their new “me”. Rather than spending their energy on fighting against the illness and its symptoms they made adjustments and so were able to use their energy positively. Those participants that wanted to find a cure to overcome fibromyalgia seemed more affected and felt the impact of the illness more severely. Adjustments vary greatly depending on the severity of the symptoms but included: taking breaks or naps, cutting back on work or volunteering, using aids such as walking sticks, accepting help, finding new outlet for creative activities, finding a new purpose and looking after themselves more carefully, for example by avoiding drafts or the cold or sitting away from air-conditioning. Self-worth and identity are often closely linked to specific activities such as our jobs, but those with fibromyalgia have to accept that they need to find different ways for feeling needed and useful. Some run face-to-face or online support groups, others contribute to their local church communities or provide company for weaker and housebound friends. These ideas have been developed within and as outcomes from the first stages of my research. The common thread across these three strategies is that they all have to do with focussing on positive experiences, reflecting on feelings and emotions and thereby working through them. In an ideal case, these activities will help to accept a new identity, which is different, but not “worse” or limited. Find a box and decorate it in any way you like. Then try to find objects to represent answers to these questions: “Who are you?” “What affects you?” “How do others see you?”. The process is not a quick fix and you should take your time choosing the right objects. In some cases you will know exactly which object needs to go into the box, in others you will specifically search for an object to represent your particular experience. The process of focussing intensely on particular feelings means that you are then able to address them. Sometimes we feel anger, but when considering the anger it actually turns out to be masked frustration or sadness. Here is a link to a video that explains the identity box more clearly. The video is aimed at research participants, but I explain the concept in such a way that those not participating in the research can make use of it, too. Think of things you enjoy doing or that make you smile and collect them in a bag. On days or in moments when you are struggling to accept your new me, get the bag out and use the objects to help you feel better. Some examples of bag contents would be books you enjoy reading, music you like listening to or treats for yourself such as special bath essences and candles. The feel-good bag should remind you to look after yourself, not to be too harsh on yourself, and that you are able to enjoy life, just in different ways. Find a journal and every evening write down three things you enjoyed during the day. These things do not need to be huge events, they can be everyday, mundane experiences, like seeing the sun shine through your kitchen window, watching birds drink water from a puddle in the street, watching television with your child or laughing at a joke. The idea is that you become more aware of what the things are that you enjoy and therefore focus on these experiences more. Also, if this journal is inside your feel-good bag, you can take it out and read through things you enjoyed before to remind you of good days and to bring back to you that perhaps you should go sit outside, because watching the birds in the street can make you feel better.